Nature gave us all something to fall back on, and sooner or later we all land flat on it. 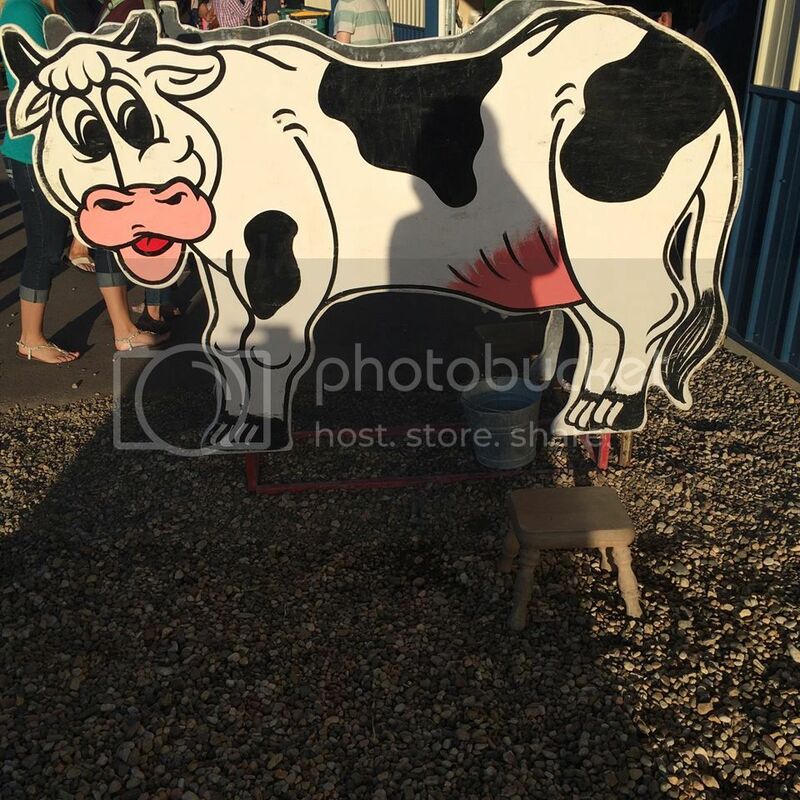 I looked at your post and went to the fair and got milked a "cow" aka Betty! I had a blast seeing the milking cows and enjoyed a few rides. May this post find all of you having a wonderful week. It has been a while since I posted anything; I tried posting twice but my computer keeps crashing, so I got frustrated and just sitting down again for another try. I am beyond words to describe how grateful I am for all of the things the Lord is doing in my life. The work situation is there; I tried applying for two jobs with Amazon, but prayed without ceasing, and God closed those doors, so I trust that he wants me to do more where I am and will make the role into what he designed it to be. I am due to support a 3-4 year project once it gets approved by the Executives later this month. They want to use my “expertise” of this new market to assist with that and maybe it will be a good opportunity to work with more people across the enterprise. It will also mean more responsibilities added to my plate on top of what I am currently doing. It will be interesting to see how God will use this opportunity for my good. I went to Mitchell on my birthday to have dinner (supper), and God managed to remember me by getting the people at the office to get a cake and sing happy birthday. We are never to old for some ice-cream cake and balloons J I was busy getting all of my licenses renewed and completing the continuing education requirements, but that is all completed an done now. I am ready to start helping people in SD. In addition, I got on a journey of losing weight on May 21st, and I have to say, I haven’t had a sip of soda or consumed a single French fry! I lost my tri-chin (aka as triple chin) and I am excited that my clothes fit better. I believe in the products and they have also helped me with my foot problem. My foot still swells, but not so much. “Cowwrangler” recommended to go to the fair, oh boy, I got to crossed off one of my bucket list items! I “milked” a “cow” aka “Betty”, and it was so much fun! In addition to “milking” a “cow”, God blessed me with the opportunity to try out a long-time dream… to learn to fly an airplane. I love to fly, and one of my fond memories as a child was having a picnic by the nearby regional airport and watch the planes fly over us. I remember those days wishing and dreaming that one day I would love to fly one of them. Well, I took my first class to see if this indeed is what I really want to do. I got to fly a Piper Archer over Minnetonka on August 6th, where I lived the first year while being in Minnesota. I felt right at home and couldn’t believe that I was actually doing it. The instructor was excellent and very hand-on, which I got to do a lot of things in the air. I think it is easier to operate a plane than a car, because you don’t have to worry about the constant traffic, but I would have to really know the plane because things can go wrong and one can easily get killed. Surprisingly enough, my mom did not get scared when I showed her the video of me flying. As I remember, I cut all of my losses with the last relationship, but God blessed me and I am finally going to be debt free tomorrow! I will be able to get my Luigi ready for the winter, and hopefully go home for Christmas. May this post find everyone safe and heathy. I was amazed how quickly the weather turned yesterday. I went to Mitchell after work to have dinner and found myself driving back in a very bad storm. I didn't know if I ever mentioned it here, but lighting and thunder scares me ( lol). I need a jacket like they have for pets to keep me calm! I stopped under some bridges for a bit to let the storm "pass" but no luck. Luigi was once again faithful but more than anything, my Lord was faithful to watch over me. Lighting was taking place in every direction and I kept cool as a cucumber, but my Spirit was very nervous. I have a worship CD and I quickly retrieved it and the song "Be Still My Soul" because a light guiding me until I arrived home. I have no desire to go anywhere today, but to be "still" and pray. My week was comprised of a lot of different events. The friend who I am very close at work is leaving us for a better role at another company. I am happy for her, but sad because she has been a light to me; she was the only person who invited me to lunch on the first day. She is a paralegal and helped me navigate some of the initial steps of finding a lawyer when I was going though the divorce. I will miss her greatly Uncle Sam also decided to remember me by sending me some correspondence and asking for $600 plus from my 2014 taxes. My mom told me this is not uncommon for Uncle Sam to question some things, just need to have my Accountant look into it. It is interesting how some people go and intentionally work under the table to get disability and don't have to report any other I come. I have done everything right and Uncle Sam decides to remember me.I don't understand "why" they didn't tell me right away if I was missing something. They are even charging me interest even though I was just notified. Once again, I placed the situation at the feet of Jesus. I have a friend who I reached out early when I loss my job in 2015. He didn't get back until a couple of months ago or so (lol) due to not being active on LinkedIn. I worked with him on a quality project where I was the project manager and reported to him. I learned that he is currently leading the furniture division at Amazon. He asked to connect yesterday. Our call turned into a phone interview for a position in his team. I was asked to follow-up with the application and he will coordinate the second phone interview. It is a role for a project manager and sole contributor. The role requires for someone to be able to drive for results, ability to build relationships, manage execution, solve problems, have drive, analyze data, and need minimum supervision. It sounds more in alignment with my skills. He said it is difficult to get in but it can serve as a good opportunity to get back into the industry and open more opportunities. In the call, he gave me one of the best pieces of advice, when I asked him " are you planning to change roles anytime soon?" He replied, " never pursue a role because you like the manager, make sure the role is something you will like and is a good fit" I was reflecting on his words of wisdom, and it makes sense. I like my manager and director, the only two people that are part of my team. I have done some very good work and "exceeding expectations" as my manager has said repeatedly; however, most days I am treated as an intern. My director just said to me last week, " you are the only person in the company that knows the most about our new business", yes, his statement is very true; however, if they truly would value what I know, they would have defined my position by now and provide me with the proper tools and authority to close the gaps I have identified. I have good relationships with people, but my two key partners that are responsible for managing our Resources, are used to doing what they want. Before I came onboard, we didn't have quality meter data for the external resources, Sweetbasil has now established this process. The reason was "the operators are very difficult to get anything from them" well, that is bull, it only required for me to know what I needed to get and build relationships. We were using estimates for the Market Settlements and now, we are using what is exactly taking placed in real-time. I also established a process to housed it in our internal systems for reporting. I am amazed people that manage these plans did not have such process established before. I was tasked with another project; to get a city manager who are company has worked for 5 years to try to get information to perform an analysis and solve an issue in questioned. I was encouraged to "bring the legal department if I didn't get though this person" while I was listening, I was thinking, " no, I don't need legal, I need God!". It only took me two months to get what I needed from this person and in the process, I made a friend. The analysis was done and it helped clarified what was in questioned. We didn't have any monthly reporting before and it was another project that was given to me. It was like pulling teeth out from my Accounting partners. One of the things I have come to hate is hearing " we didn't do this before, why we have to have it now?" Any person with some common sense will know that if you don't have some type of reporting to measure performance, you are walking in the dark. The Accountants were pushing back so hard when I was asking questions to where the fuel inputs could be retrieve from. I established a monthly reporting tool and process that shows the total delivery costs per month, MWh, the costs trends for different a areas such as generation, load, etc from previous years and months. It has been used to present to the Executive Board. Everything is real time monthly information presented in the report, except the fuel, those are estimates due to being in month rear when the actuals come in. There was some push back from the Accountants as to when they can make the estimates for the fuel available in July and their story is that because we are using the fuel estimates we are not presenting the exact thing they have in the books. They saw this reporting as something written in stone. My director just communicated that the Accounting manager was anxious about this report and we will not continue with our current process, but wait until they have they information posted. I can't believe it; getting all of the data consolidated and creating the reporting dashboard was a big project and it took a lot of time and effort. Now, because some woman in charge is not getting her way, we need to stop our business to let her get way. My director said that we might have to create a different type of report. I just wanted to tell him " go and have the Accountants do it, at the end of the day, they should know the cost per MWh for the day and month. If an Accountant does not know this nor has this process established, I think he/she is incompetent at his/her job!" I am a good fit for my current role because I am driven, drive for results, and perform well in a fast pace environment, which is exactly what the new Market is. Before the other Market Adminstrator dictate the company when to go potty, and this Market is on,y going to point you to the direction where they have information available to operate our business in this new business environment. I am getting to the point that I don't know if this is good for me. I am working 60 hours a week and the 20 additional hours is not because of me not managing time, but because people are not willing to get engaged in the new business, they want Sweetbasil to do their job. My manager and director are aware and nothing has been addressed. My manager keeps saying " I am so impressed with your work ethic" but what he does see is that even the best working horse at some point has enough. I do a lot of things on top of projects and then I end up picking the slack for others given to me by my own manager and director. For example, it has been a little over two months that I coordinated a call with my partners in the Market and director and another woman who is repinsible to establish the process for acquiring additional transmission and interconnection. My director and this person have been working with the Market, and did not make any progress. My manager comes to tell me " x is so frustrated that no progress has been made and since you have good relationships in the Market, we would like for you to drive this process!" I have been asked to put a procedure documenting exactly every single step and piece of information required to submit to the Market and what we need to do internally. I wonder, what is that woman's real role? I was given two weeks to get this done. I am making up for the time that was loss. The same link that my partner sent after that call that I participated has most of the necessary information. It only took me 20 minutes at a maximum to confirmed the information. People want to be "spoon feed" as my manager said because the other Market Adminstrator did everything for us, unfornatuly, there is only one me, and I am being pulled in all types of direction. On top of my daily operations. Invoice reviews, managing the vendor, driving my own projects, I am also asked to not only project internal partners with the tools and resources needed to execute their functions that pertain to the Mrket, but also document and establish procedures related to those functions. I put my name in the Amazon hat and will start praying for other opportunities. I have been praying a lot about the situation and will trust that God will direct me. Once Dr. Charles said in one of his sermons, " if God has a ribbon with your name on something you want, no matter what happens, nobody can take it away from you, because it belongs to you!" I figured, if it is part of God's perfect will for me to continue here, He will work everything for my good. I am learning to speak up and take care of myself, because nobody in this earth will do it if I don't. I want to share a sermon from Dr. Charles that blessed me. I hope that it will bless many of you as well. mrj wrote: A very happy birthday, Miss Ella! It is sent from under the leading edge of lots of very angry looking clouds boiling around above our house. I knew it was a bit cloudy but have been ironing in the basement with a curtain over the window to keep the sun and heat out, so didn't see the progress of those clouds. A quick trip out to get my laundry off the line was in order! I came upstairs and threw a question over my shoulder to Shorty as I passed his office, and got no reply. Then remembered he was going out to the shop area to help grandson Bryer do something with some of the haying machinery being cleaned up for the season. Now, I believe they are putting vehicles and machinery into the shops, fearing we may get hail. Think there are a few big rain drops starting now. We surely could use some rain, but none of those ice cubes from the sky!!! Or as our grain farming friends say "that big white combine in the sky". I hope most of the wheat has been harvested because even a hard rain can be very damaging at this stage. Not sure how it treats sun flower seeds and other crops, but probably doesn't do it any good. Matthew has cows standing in our corral, and their calves in another pen beside the cows. They are being weaned. They are Longhorn cattle and he is going to use the calves for calf roping practice, so weaned them a little earlier than we normally do. Not sure what time I started this, but is now 7:45MDT. The storm is over. Lots of wind, thunder, and .49" rain. No damage that I can see and the rain is very welcome. The cows mentioned above are none the worse for it. Probably found the 'shower' refreshing! Now, there is a dark cloud building in the east, so may not be finished with us yet. There have been wild T-storms in the area for a week or more. Very scattered and widely varied rain amounts, a little hail....way too much in some places, none in others. We've heard rain amounts a few miles north of hiway #14 west of Midland up to 8" and some believe it was more than that but couldn't measure that much. Small areas, with some high water on the small creeks and Bad River up a little. I didn't check the monitor on the internet and won't have time tonight. Need to get some sleep as we drive to Cheyenne tomorrow for the last three days of rodeo there. Then have to stop in Rapid City on the way home and consult a surgeon for back problems. I could do without another surgery, but the first one I had really cured the problem, so unless there are other options, will have it repaired. Ella, did you hear shrieks of fun from the direction of the zoo today? Our son and dau. in law took their four year old grand daughter to see the zoo today and are spending the night in SF, so maybe she will get to see it again tomorrow before they return home. Think they had a full schedule and are spending the night with relatives there. That little girl has had a busy few days, going to the movie "Dory" on Sunday, a Steer Tripping event at the Days of '76 in Deadwood yesterday, and now Sioux Falls fun for her. Too bad events like that come so close together, but when the opportunity presents itself, in this part of the country one has to act, or it is gone! Shorty, one of our sons, and my brother also went to the event in Deadwood. They enjoyed it a lot.....is an understatement! They also saw quite a few friends. One was a college friend of my bro and they hadn't seen each other in about 50 years. Our family had an 80th birthday party for Shorty on July 9. It was hot, just like 1936, but this is a better year, as we had at least half a hay crop. His dad always said Shorty was the only thing on Brave Bull Creek that grew that year! Guess we have had more rain, and the heat hasn't been terribly intense, but plenty warm enough, too. We had a tent with the sides up, and a porch with a roof over it, so there was some shade for those who stayed out near the chuck wagon and saddle display, and the AC kept the house nicely cool for the dozens of people who stayed inside. More than a hundred people signed the cute guest book one of our sons made. There are about 120 cards now, and some of them are LOTS of fun to read. Those will be fun to go through whenever we need something to laugh about. All our kids and all but two of our 'grands' were here.....we missed the one in Lincoln, and the 'California/Sioux Falls' one, too, Ella. At ages 76 (mine was July 24) and 80, we especially appreciate the family members and friends who are even older that were able to attend. My 92 year old uncle, and friends in their '80s and more who were able to come to the party are treasures for whom we are thankful. Well, I need to work on getting packed, hopefully getting to sleep early tonight, too. All this fun we are having and trying to do a bit of yard work is tiring on a 'seasoned citizen'. Everything seems to take way longer than it used to......wonder why that is??? In addition to other blessing to count, this little rain sure washed the dust off the grass, trees and brush up the hills and valley south east of my window! And will keep that green color on the hills for a little longer, even as the seeds ripen and turn brown in places, a little green at the base lifts my spirits. Have a great birthday WEEK, Ella! Have a blessed Friday and weekend! 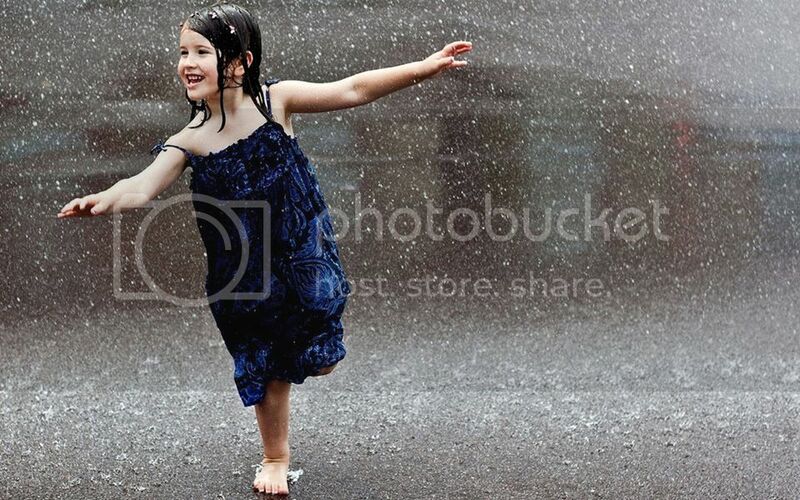 When was the last time you were so happy that you wanted to dance your way in pure joy? I can certainly identify myself with the joy that this little girl reflects in this picture. A year ago today, I was still jobless, and my future looked very uncertain and dark. As I look back today, I can only thank God once more time, for his unfailing love, grace, and plans for my life. I never thought that I was going to be jobless for 7 months, on top of that, with the marriage situation. Just to throw in the cherry on top, I was 1,939 miles away from “Home”. I never thought that I was going to be in SD, but God had other plans, and I am able to see “why”, so that I can depend on him for everything, and not on my own doing. In the midst of the trials, I surrendered myself to God’s will for my life and turned over the “wheel” in order to stop being loss and finding my way “home.” Slowly, I got to see his goodness and the many roles that God can play in one’s life. He picked me up, cleaned my tears, and let me know that “I will never leave you nor forsake you”, something that appeared foreign to me at that time. It was rather a hard thing for me to grasp intellectually, because I have always lived by the motto of “if you can’t go and earn it, nobody is going to do it for you” from a very young age. Depending on myself too much for everything was a wall that I needed to break down in order to “trust” that he was going to make it happened without me needing to “help” or “earning it”. Relationships do not only requires for one to invest emotionally, spiritually, but also financially, so, if you are committed, you will be left with lots of pieces to pick-up if such relationship does not turned out the way you hoped for. My losses were so ridiculously that I moved to SD without even towels or dishes! When the devil tried to get me caught in his web of lies by reminding me that “see, you don’t have anything to show for the last 4.5 years, but big losses”, the Lord would remind me “if you abide in me, and my words abide in you, ask whatever you wish, and it will be done for you” and “delight in me, and I will give you the desires of your heart”. Such reminders were so comforting at that time and since I didn’t have anything to lose, “why” not giving him whatever “best” of me that was left? His constant sweet whispers were always faster than the enemy’s waves of lies trying to convince me to not listen to the truth. I am extremely thankful to the Lord, because I have never have had a father, boyfriend, fiancé, lover, or sugar daddy, to buy me cars, pay my bills, or provide, but I know with all of my heart that God has never “forsaken me” and he has always provided me. It has never been anything because of what I have done to “earn it” or based on my performance, or behavior, but because God loves me unconditionally. Ironically, I have been listening to an in-depth study of Philippians to understand “Who I am in Christ”; and the first study has been on God’s wealth for me as his child living in Christ. I have learned that the basis of my wealth is based on God’s will for my life, his grace, his power to created it, his unfailing love for us, his kind intention, his purpose, his calling, his inheritance for us, and his workmanship. I can only say, AMEN to that! The devil was definitely wrong the many times that he tried to deceive me by telling me that “… you don’t have anything to show for”, because “I was not left with nothing to show” but with everything to gain, because Christ is the key that allows me the opportunity to love, respect, and honor my Heavenly Father, and in return, I have access to his inheritance. I am no longer a vine whose fruits were not of great quality because I was fertilizing my vine with the fertilizers of this world, but now, I am watering it and tendering with God’s best fertilizing ---- his Word and Discernment, while Chris is my gardener teaching the secrets to bearing the fruits of the Spirit. All I can say is, regardless of how dark your situation might look right now, let Christ take over the wheel of your life, seek him with your whole heart, and the be to find yourself in awe of his goodness. I didn’t find “love” in this world, but I found eternal and unfailing love in Christ and it is thanks to his unfailing love that he has provided me the ability to recover all of the emotional, spiritual, and financial losses tenfold. Thank you, "Cowwrangler". I would love to milk a real cow one day.